Difficulty Notes: Our ascent line was via west scree slopes. 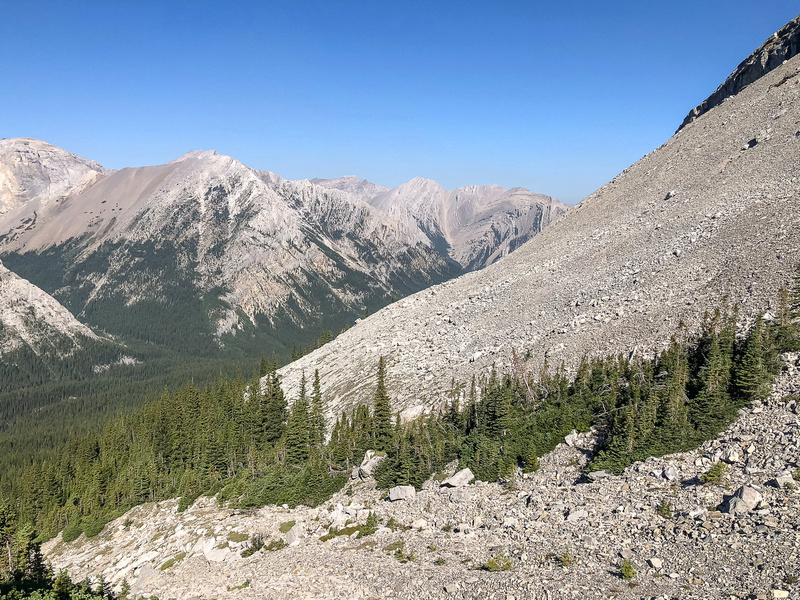 If following the connecting ridge from or to Junction Mountain (which we did) it is up to Class 4 with loose terrain and routefinding challenges. 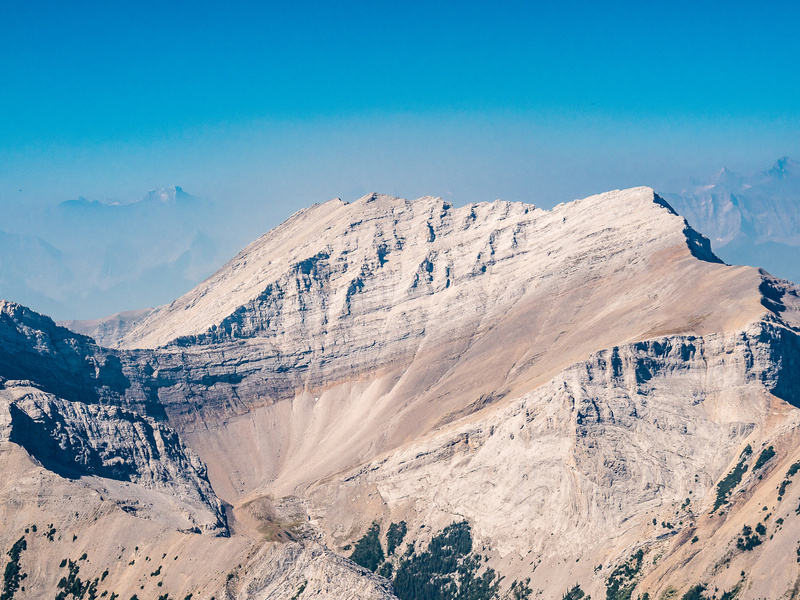 Wietse and I found ourselves with a day off mid-week on August 22, 2018 and decided we should probably take advantage of the perfect weather forecast by standing on a summit somewhere. The real question was which summit should get the nod? 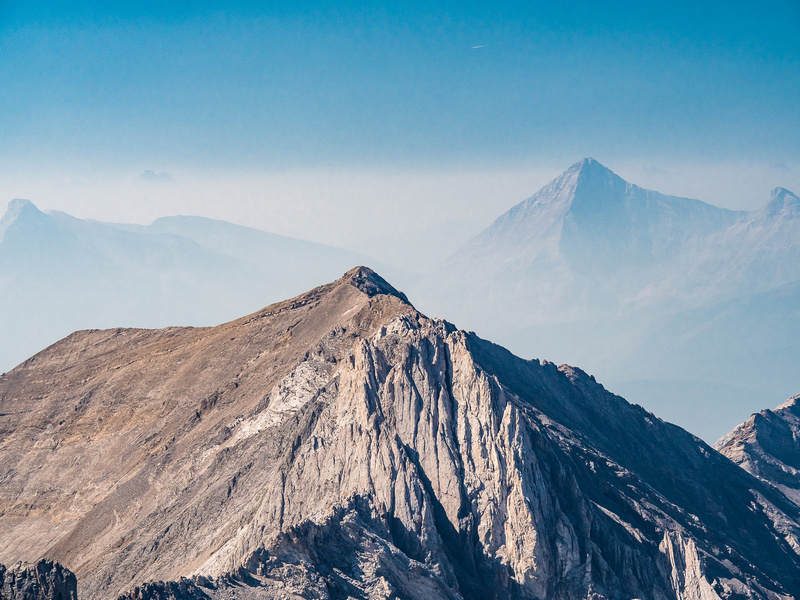 The issue wasn’t conditions – everything was pretty much in great condition – the issue was the levels of smoke we’d encounter and the corresponding lack of views or breathing issues we’d have to deal with. 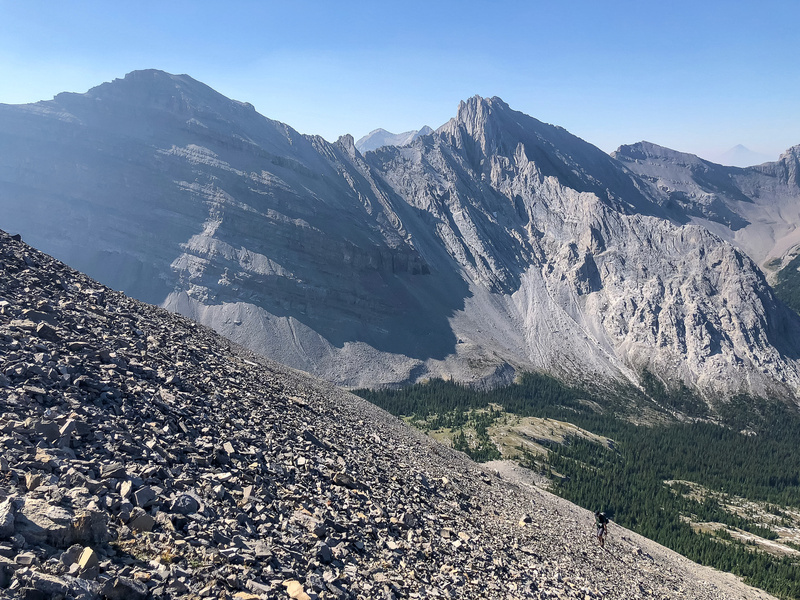 After going around in circles several times, we finally settled on an ascent of Pyriform Mountain in the Highwood Range of the Rockies in front range Kananaskis Country. Pyriform is an interesting peak, if for no other reason than there’s not a ton of beta available for it, although half the approach is along a very popular trail to Junction Falls. There’s a smattering of trip reports if it’s Googled, but it turns out to be a bit vague and a bit inaccurate in terms of effort on hindsight (i.e. the total height gain for just Pyriform is over 1400m return from the parking lot, much more than Jose’s indicated 1050m). We definitely owe Rafand Jose for the beta they provided, as this was key in keeping the route finding simple for us. 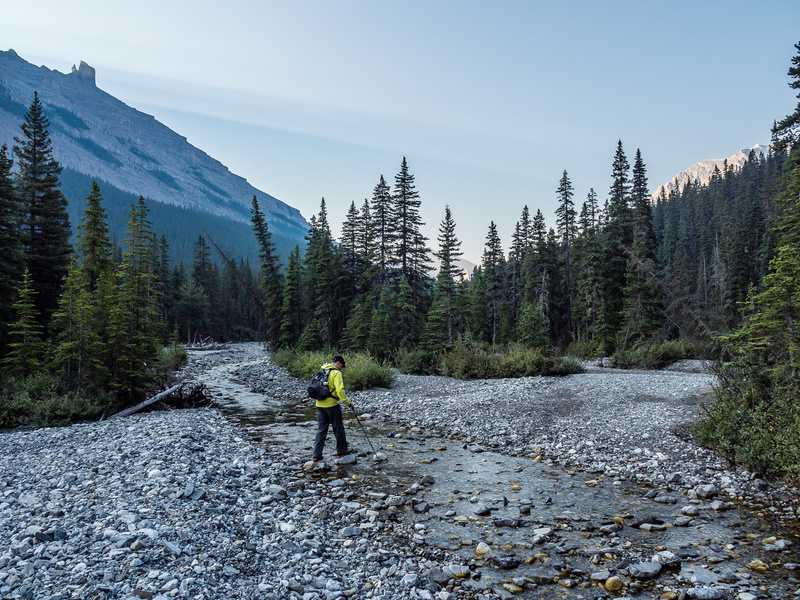 We arrived at the parking lot at the end of hwy 546 around 07:00 and proceeded to cross the low-flowing Sheep River to the Junction Creek Trail which is labeled as “Tunnel O’ Fun” route on my Gaia base map which is an odd name for a route. 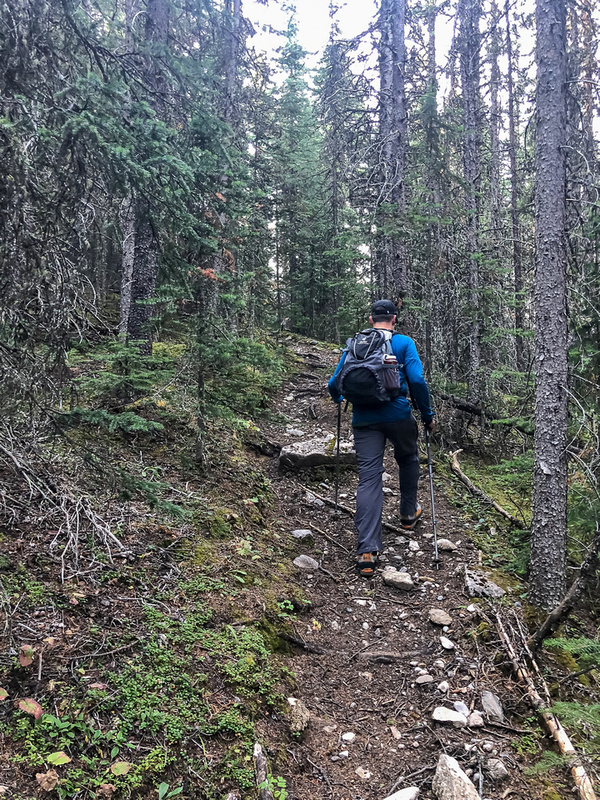 After switching our footwear we started along the lengthy approach up Junction Creek to the unofficial campground and turnoff to Junction Falls which is along a pretty popular and worn trail. Raf mentions biking the first 4km of this trail but we figured only the first 3-3.5km were easily bikeable, after which the benefits of biking vs. walking would quickly diminish. The trail was pretty quick and time passed quickly while we chatted. I could still feel the effects of Phil and my long trip into Mount McConnell and Tilted Mountain less than a week previous but I felt surprisingly refreshed despite any lingering soreness. We were in pretty good moods because the levels of smoke were much less than we expected based on forecasts. The trail becomes less bike-friendly after the 4km mark. The first 7km of trail were pretty easy to follow and well maintained all the way to an unofficial campground located near a trail leading away from the main creek and up to Junction Falls (ironically “Junction Falls” aren’t actually located on Junction Creek but rather on a feeder creek into Junction). There was only one section on the first 7km that navigated in the creek bed that we had to pay attention to, and some sections of obvious horse traffic wear and tear. 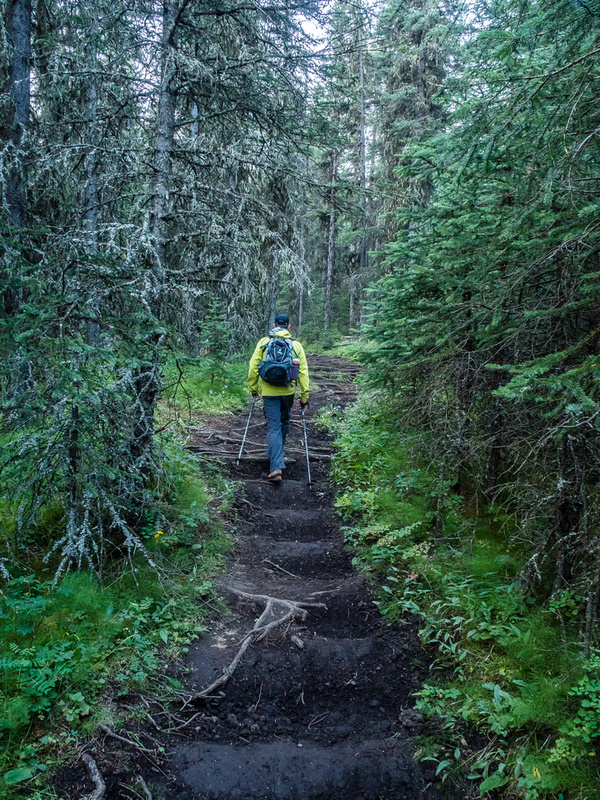 Once we arrived at the first camp site we knew that we had to cross the stream that leads up to Junction Falls and continue on a trail on the opposite side. This was harder to navigate than it sounds, since the main Junction Creek trail just keeps going up a stream and even though we were on the lookout, we still had to backtrack to find the proper crossing! 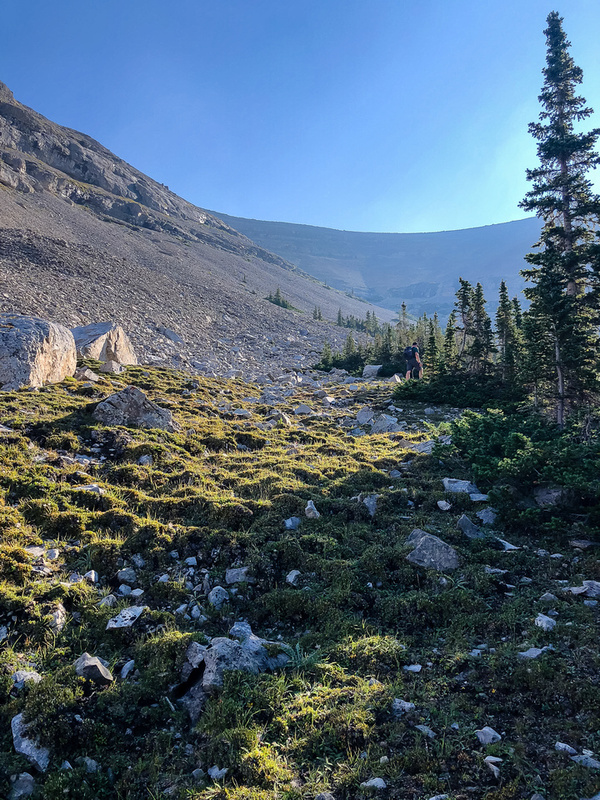 From the first camp site we followed a much rougher and less traveled trail to a 2nd unofficial camp located high above Junction Creek where the trail dipped steeply down to a gorgeous pool and small waterslide feature before continuing again on the opposite side. At this point we realized that this was going to be a pretty long day as we were already 2 hours into our day and around 8km down the approach but still far from the mountain. The day was also going nuclear – at 09:00 we could feel the heat even in the shade of the forest. From the pool crossing the trail finally started gaining consistent height and continued to be obvious although less and less maintained with trees fallen across in several spots. 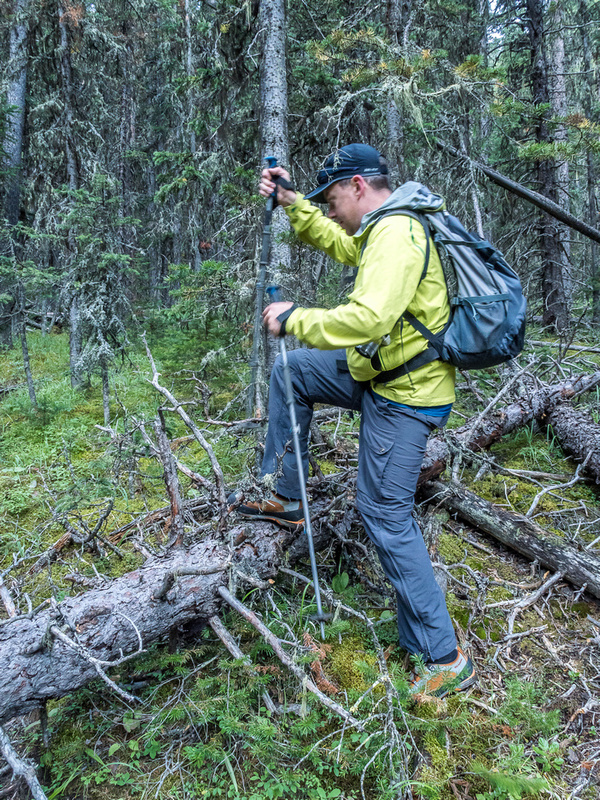 Raf mentions this trail “losing height” before crossing a drainage towards Pyriform and he’s not wrong! That section was in the back of our minds the rest of the day – we must have lost at least 100m here and I still have no idea why? 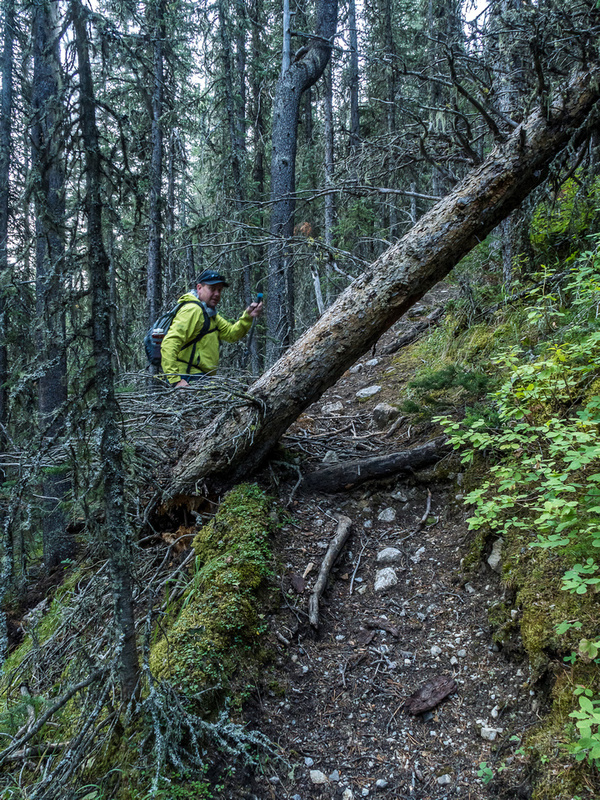 After almost 10km of travel we crossed a final drainage and started steeply up the south side of it, still on trail. 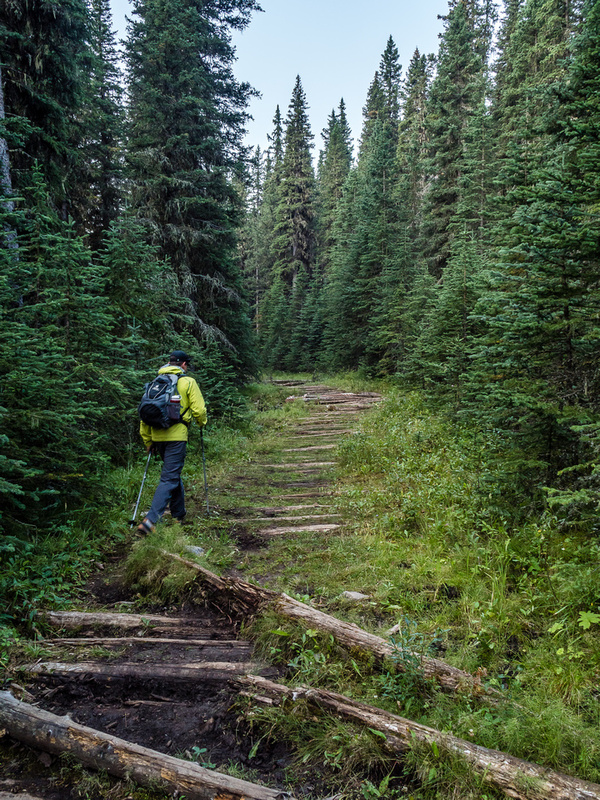 Just as Raf says, the trail faded near treeline as we approached the west bowl of Junction Mountain. The gorgeous deep pool just downhill from the 2nd camp site. We crossed Junction Creek here before going uphill on another good trail. It was here that Wietse first started playing mind games with me. 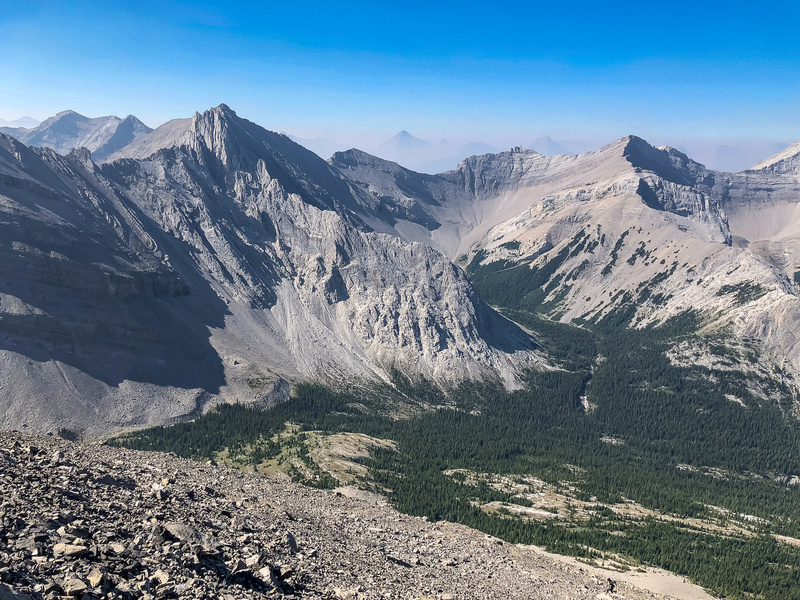 As we started the treeline traverse to the west scree ascent slopes of Pyriform (not visible yet), he casually mentioned that “Junction Mountain is only about 600 vertical meters from this spot”. This was no accident as I found out later! Wietse knows me way too good. He watched as the gears started turning in my head already at this point. Could we bag Junction on return? There was a huge problem with this “plan” though – we were going to be very short of water as we’d only filled about 1 liter each in order to get up and down Pyriform. 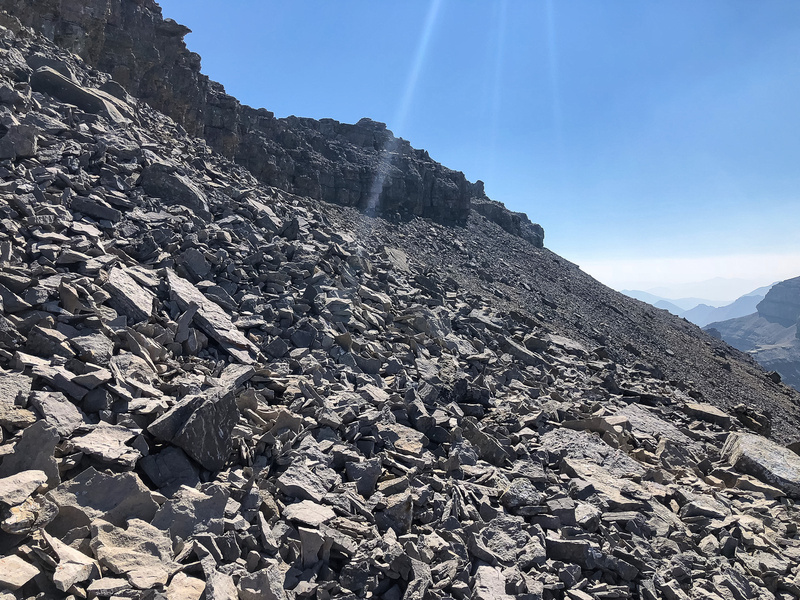 There were no more running streams around us on the dry scree slopes… We slowly traversed to the obvious scree slope that lead up to Pyriform – trying to stick as much as possible above treeline while not going too high into premature cliffs. It was on this relatively easy terrain that I took a bit of a violent tumble! I was walking along, not paying enough attention obviously, when a large boulder turned underfoot and I was down. My leg took a beating as well as my right hiking pole which snapped near the end. Needless to say this event didn’t make me very happy for the next little while. 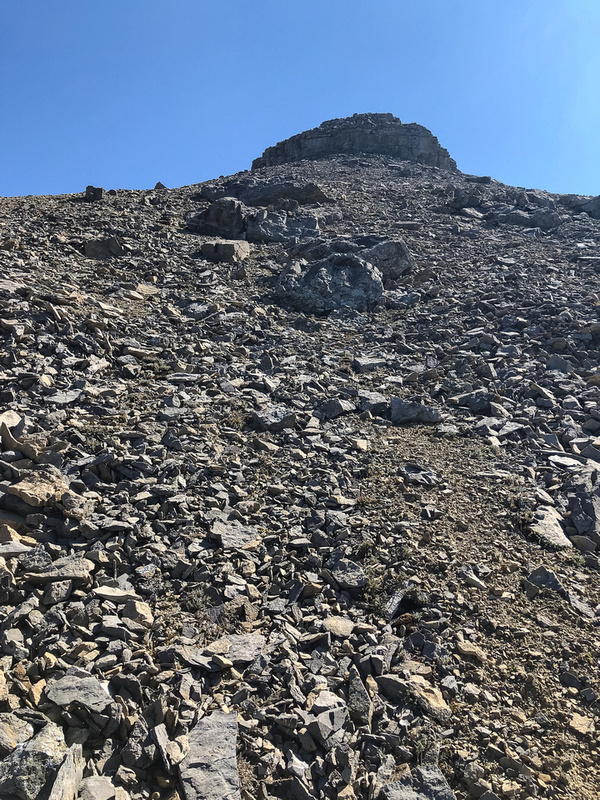 It took an hour of steady travel before we were finally looking up an endless scree slope to the summit ridge of Pyriform. 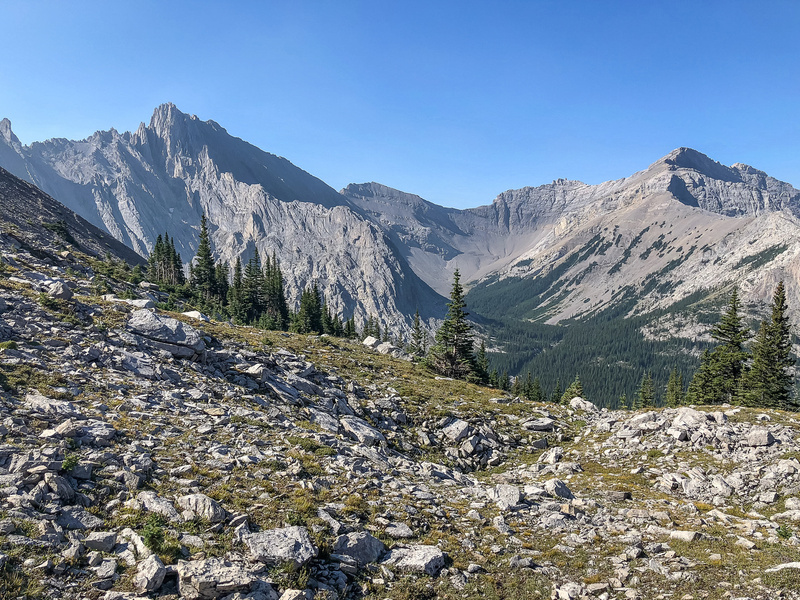 Helping the tedium of side-hilling was excellent views over the Junction Creek Valley towards the various Lineham peaks in surprisingly clear and smoke free skies. 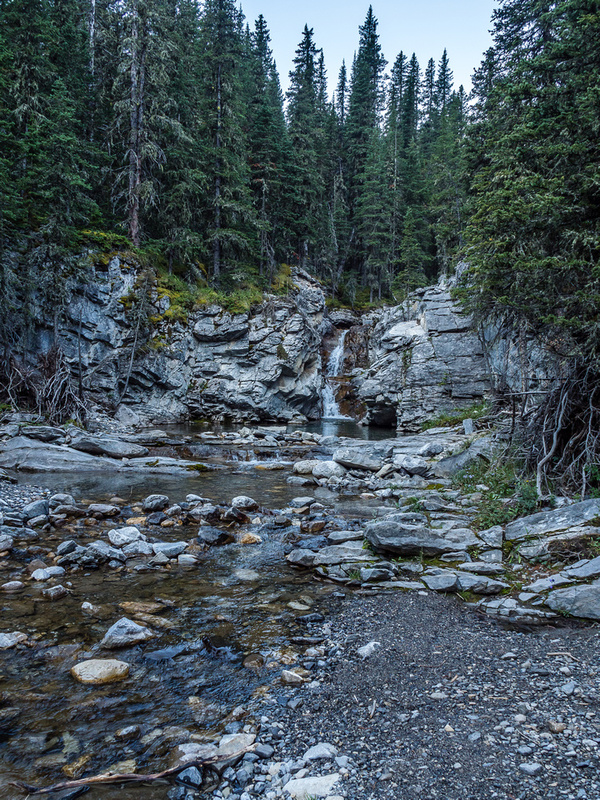 As I gazed into the lovely headwaters of Junction Creek, I was struck by the same thought I’d had earlier in the year on Mount Mann while hiking up Cataract Creek. 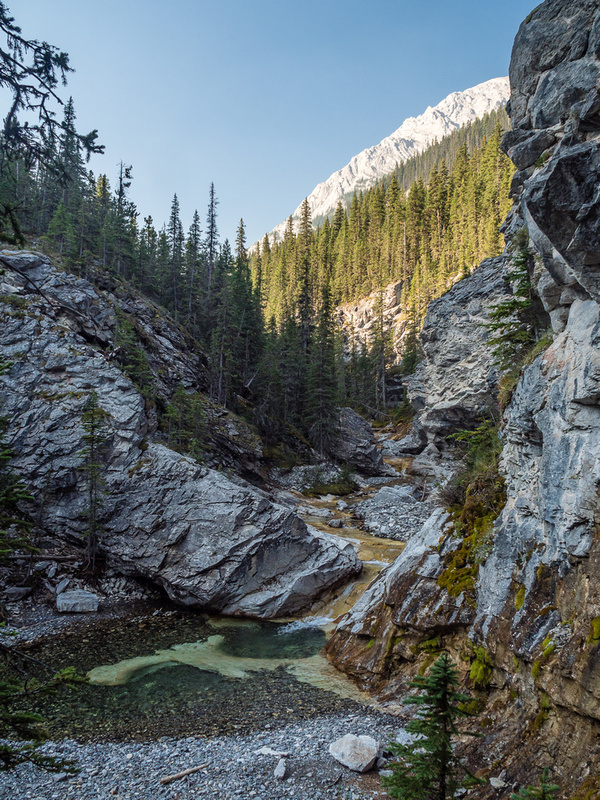 There are so many of these “hidden” valleys tucked away in Kananaskis Country, it really does blow my mind how beautiful and quiet they are. We commented several times how remote and utterly devoid of humans our entire day was, despite being front country travel. The scree slope was just as it appeared. Endless. Brutally endless and quite loose. Not quite as bad as the worst parts of McConnell was, but still bad enough and the relentless heat of the summer sun was energy sapping. 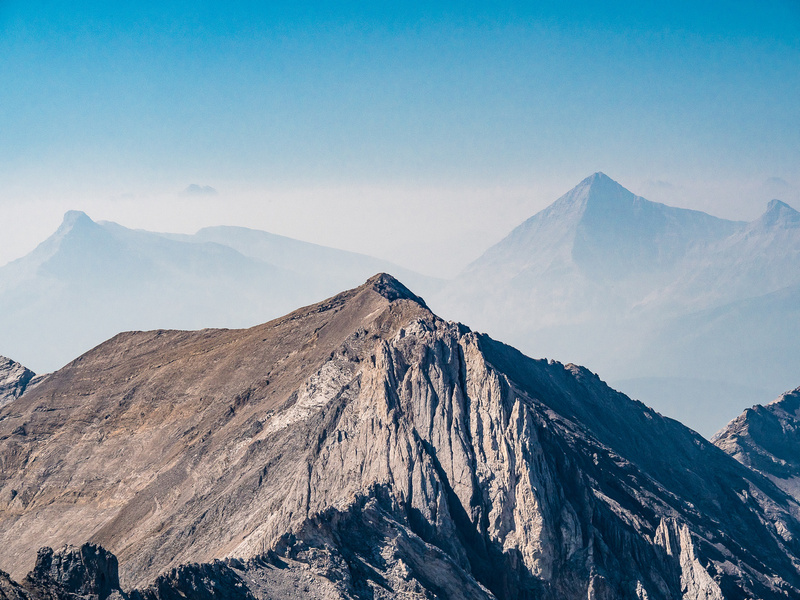 Another issue was a mix-up in the elevation of the mountain. 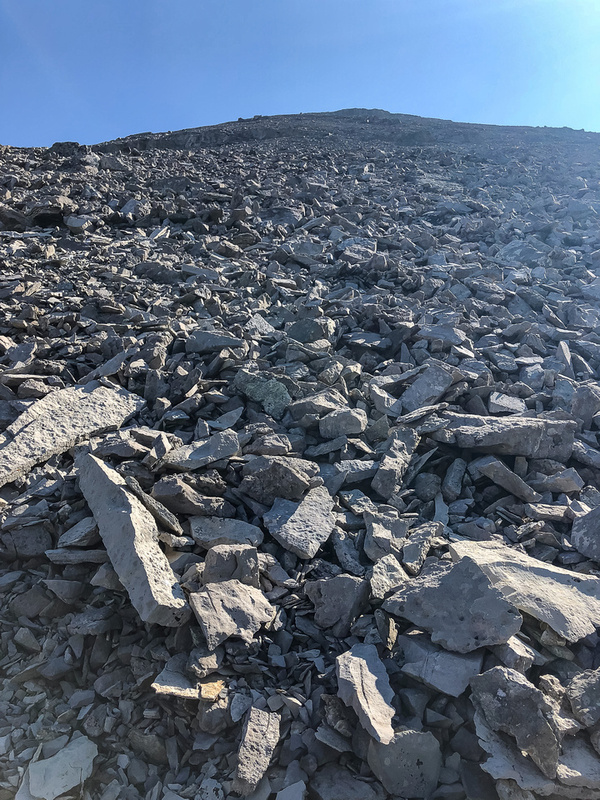 My Gaia basemap had the elevation as 8599 feet, so I confidently told Wietse we only had around 1200 feet to the summit from where we started the scree slog which is only around 360 vertical meters. Yeah right. I screwed that one up, which became more and more obvious as we slogged our way slowly up the slope! It wasn’t until I actually looked closely at the contour elevations that I realized that Pyriform is over 9100 feet – not 8600! Damn! That added an additional almost 200 vertical meters. Wietse wasn’t very impressed when I yelled the new numbers down to him. 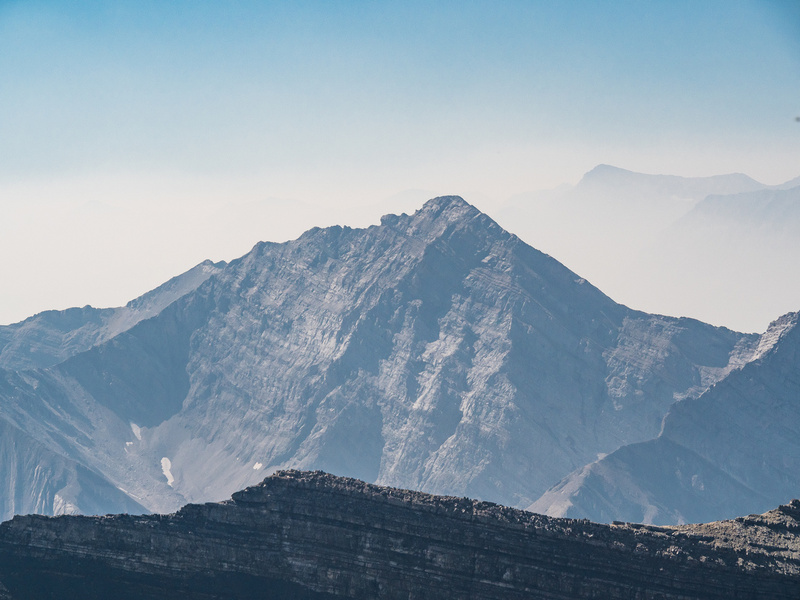 After what seemed like a long time but was only around 45 minutes of huffing and puffing the angle eased off and I found myself looking at a line of cliffs along the ridge above me, supposedly leading to the summit somewhere south of my position which I couldn’t see yet. Dogtooth Mountain with Wietse and the endless scree slope. I traversed under the cliffs until I spotted a moderate / low difficult break through them and heaved myself up and over to the ridge proper. This is avoidable, I was just sick of side-hilling. The summit was finally visible and at 11:30, about 4.5 hours after leaving the car, I was finally approaching the summit cairn which was emitting an odd buzzing sound. As I approached the cairn I was horrified to see it literally crawling with winged bugs of some sort. I’ve seen this before, but these were nasty little creatures that were way too interested in me to make me comfortable! I decided to stay far away from the cairn and set about taking photos and trying to choke down a granola bar (I was overheating a bit and didn’t feel very hungry at this point). I was very surprised to see how smokey it was only one valley to the west and realized just how lucky we were to be having the views we were on this particular day. 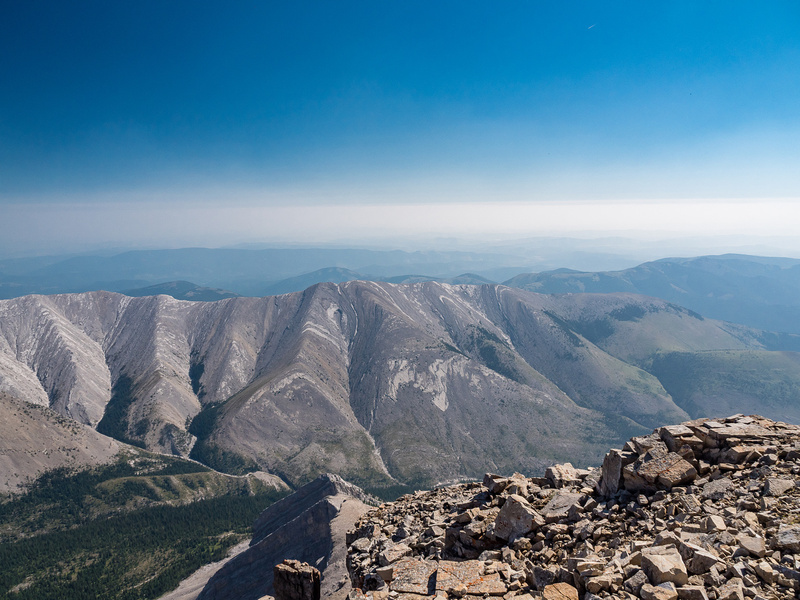 I also had cell reception and Googled “Junction Mountain” in order to see what scrambling that peak entailed. Wietse’s devious mind tricks were at play but I was changing the game a bit on him. While he initially implied we could tackle Junction from its west alpine bowl, I was much more interested in utilizing the obvious ridge running from Pyriform to a distant Junction – an option that would obviously save us from 100’s of extra meters of height loss / gain and also save hours of time in the scorching sun. 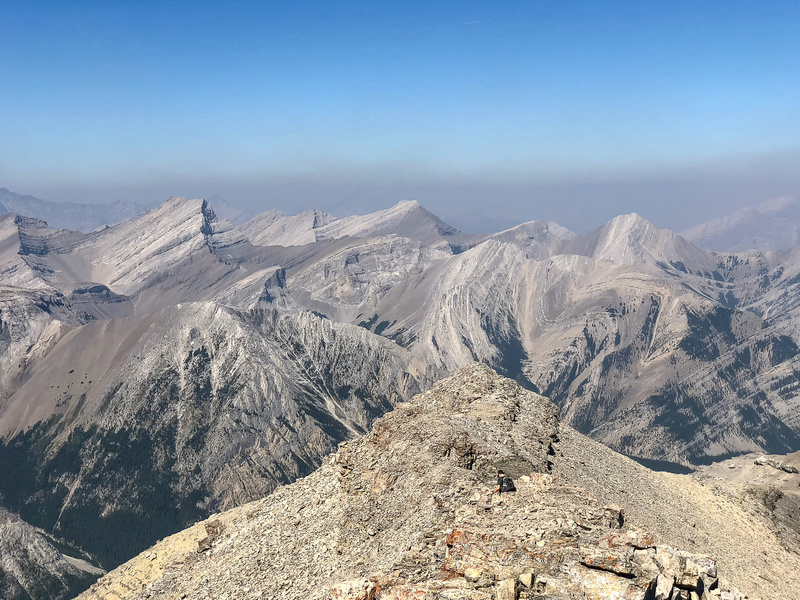 Of course Jamie Junker’s trip report came up on my phone as the only documented traverse from Junction Mountain to Pyriform and it didn’t sound too easy. I saw that Geoff Hardy had gone with him, which made me feel a bit better as I can usually do what Geoff is willing to do in the mountains. Looking south (L) and west (R) off the summit towards (L to R), Head, Patterson’s, Dogtooth, Serendipity, Lineham and Highwood. By this time Wietse had joined me at the summit and we discussed doing the traverse to Junction. 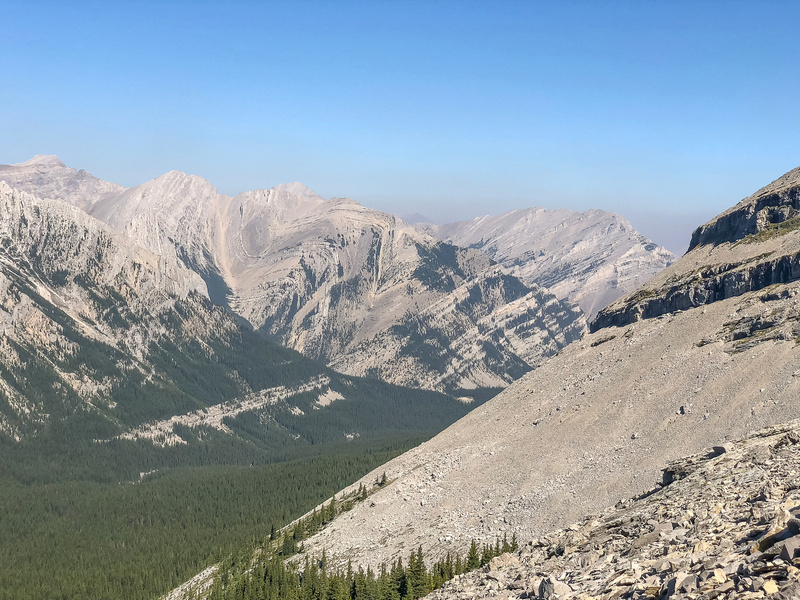 At first he wasn’t too keen on the idea, expressing concern that we were doing a difficult traverse in the worst direction (down instead of up) and that if it didn’t work out we’d be stuck on the ridge as there were limited options for bailing. 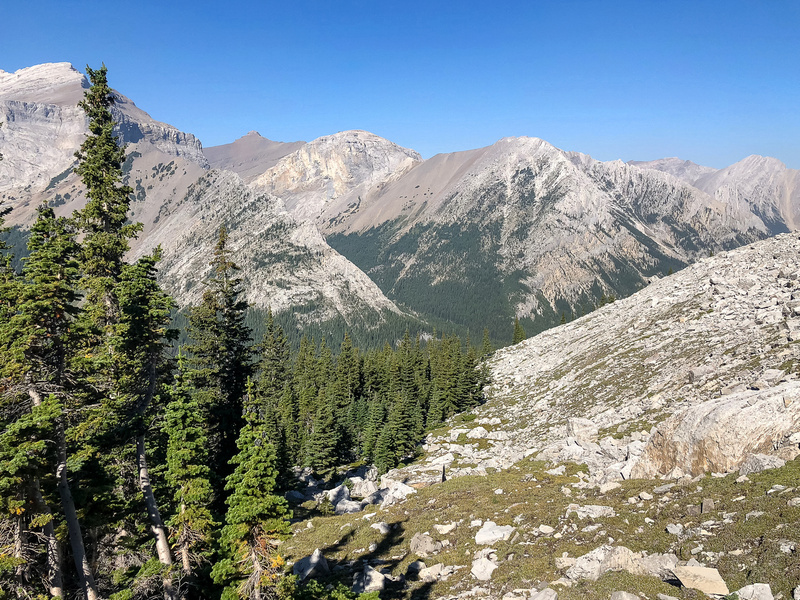 Another concern was that the crux was about 2km away, closer to Junction Mountain – we wouldn’t know for sure that the traverse would go until we were a long way into it. His concerns were all valid but I wasn’t convinced by them for some reason. In my opinion we could overcome any obstacles along the ridge, and why else had we brought our helmets if not to do some spicy scrambling? 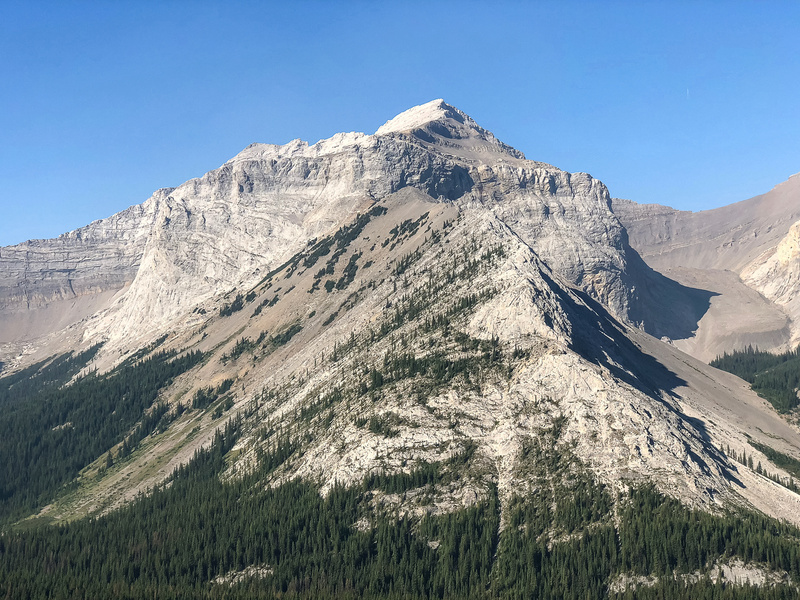 That logic was very hard to argue with apparently, and since there were now small flies biting us we decided to get the heck off of Pyriform and get our noses into the traverse over to a distant Junction Mountain – measuring around 3km away from our current position. Ready to cross the Sheep River, looking upstream to Shunga-la-she. 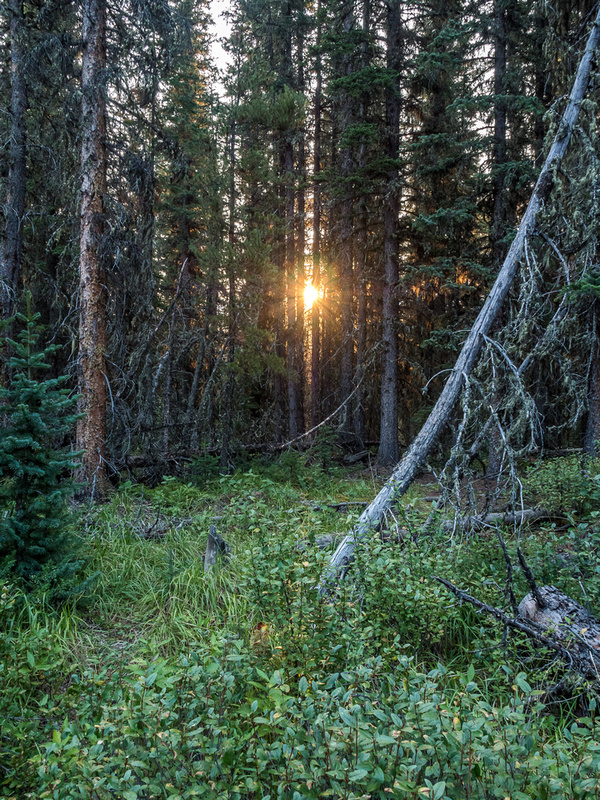 Sunrise through the forest beside the trail. The first 3.5-4km of trail are very bike-friendly - at least when dry like we had. 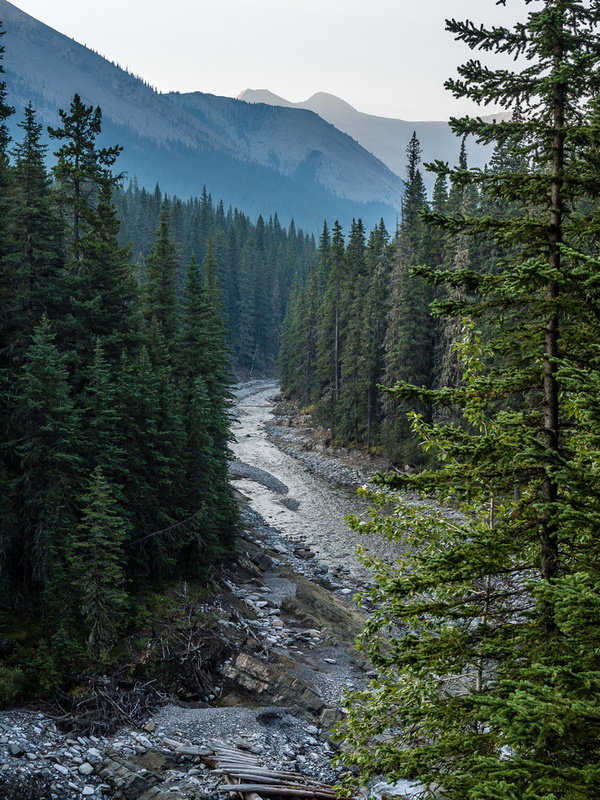 There are several gorgeous lookout spots along the trail overlooking Junction Creek. Some obvious signs of horse use along the trail. The trail vanished for a bit along Junction Creek where we took to the gravel flats before regaining the trail on climber's right. A view of the falls beneath the first unofficial camp site. 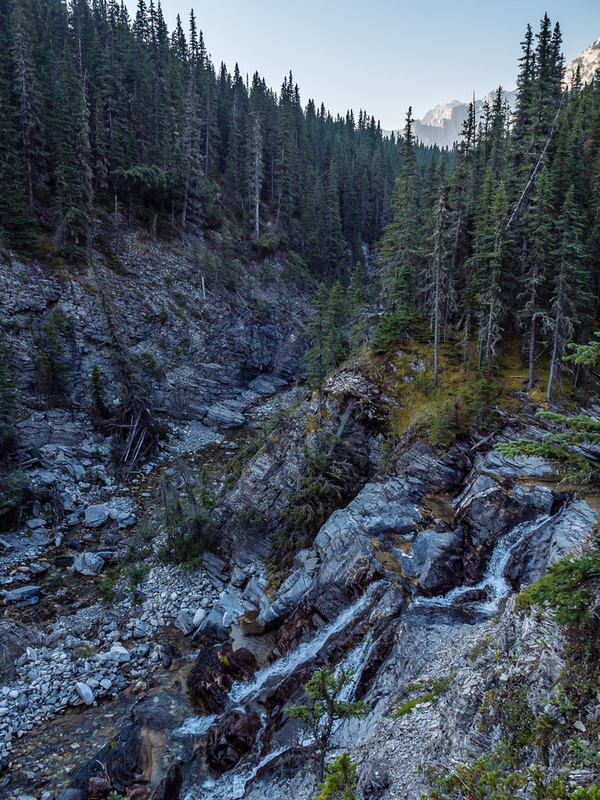 The creek coming out from the right is the one to Junction Falls, but Junction Creek is at left here. Crossing the side creek after the first camp site and looking up stream from the crossing. 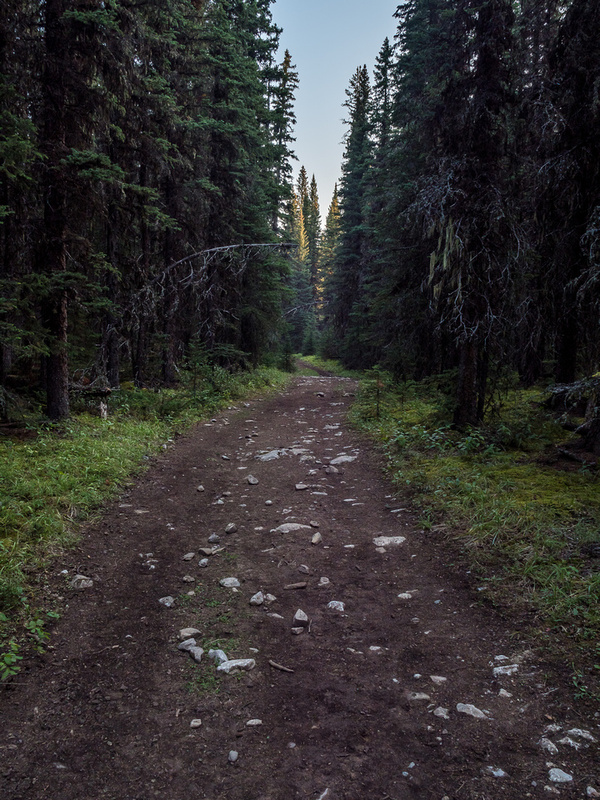 The trail from the first camp site is definitely less maintained than the first 7km is. Still on trail, still mostly in the forest. Looking back along the drainage towards Shunga-la-she and Highwood Peak. Looking up the drainage that we'll follow to treeline before our trail fades out. Outliers of Junction Mountain visible here. 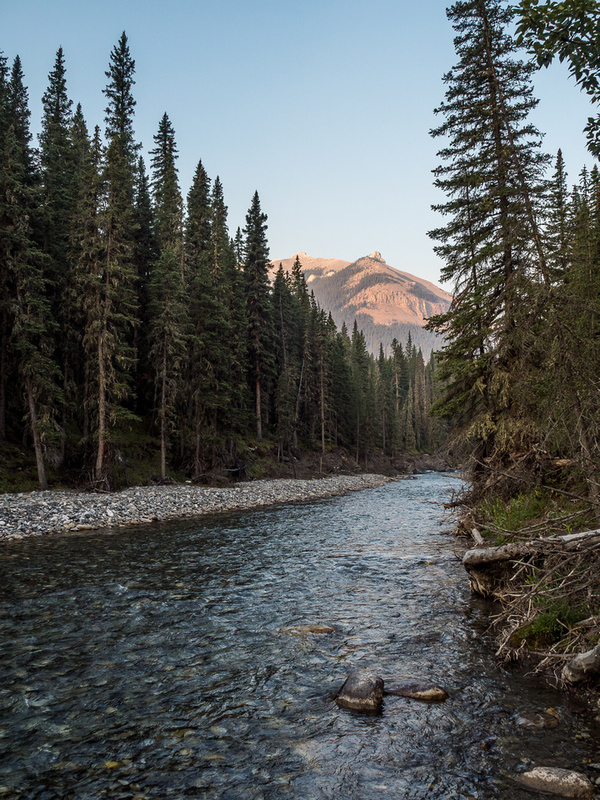 Great views across Junction Creek towards one of the Lineham peaks. Traversing to the west scree slopes of Pyriform around a scenic hanging valley along the way. Looking back along treeline and our approach. Note the lack of smoke? Looking back at part of our traverse line. Part of Dogtooth Mountain at left with more Lineham peaks at right. 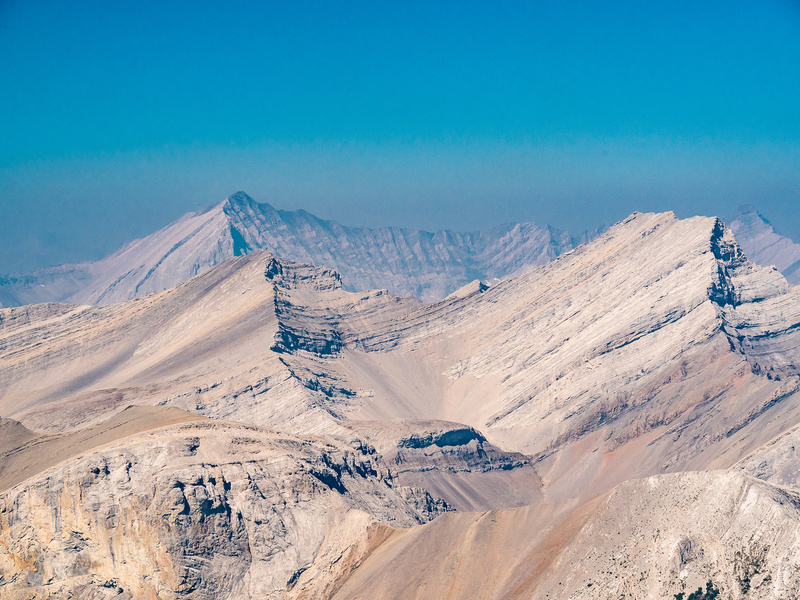 Looking far down our approach up Junction Creek Valley with Highwood Peak at left and Shunga-la-she at right center. t first we thought we only had 300 vertical meters of this. Than I realized the map had labeled the peak elevation wrong and we had more like 450-500 vertical meters! Easy scrambling through low cliffs about 2/3 way up the scree slope. 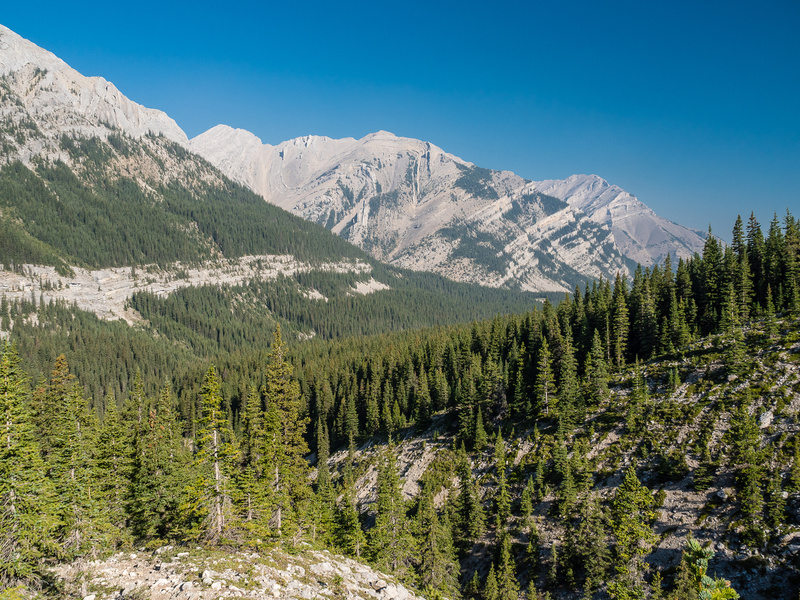 Gorgeous views back over Junction Creek towards Lineham Peaks. Views over Dogtooth and Lineham Ridge to the west. Note the smoke in the hwy 40 corridor in the distance? We got pretty lucky with clear views in our little valley. Approaching the upper cliff band on the ridge to the summit. Traversing the summit ridge cliffs. I went about half way before tiring of the traverse and simply scrambling a moderate feature up to the ridge crest at left. Great views west (L) and north (R) from along the summit cliffs. Again - note the heavy smoke covering mountains only one valley west of ours! 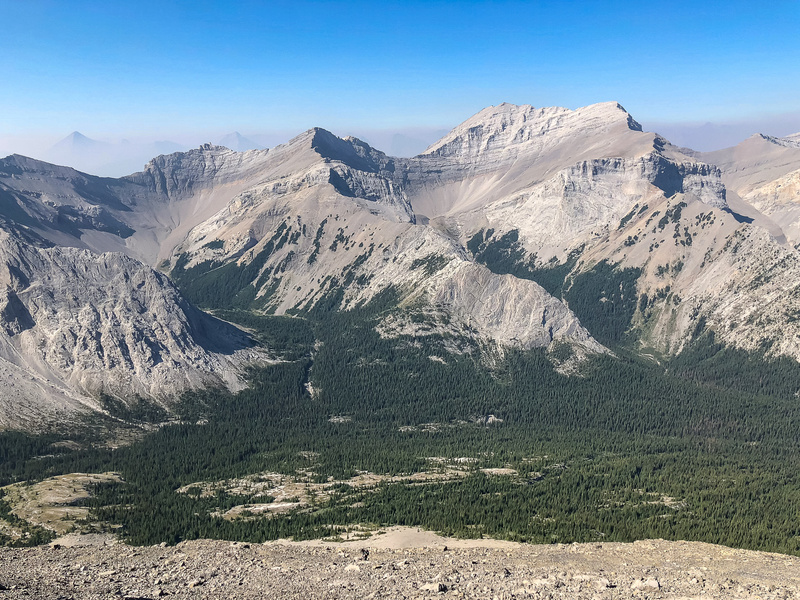 Views west (L), north (C) and east (R) off the summit include (L to R), Lineham, Highwood, Shunga-la-she, Burns, Bluerock, and Junction Mountain. Looking south (L) and west (R) off the summit towards (L to R), Head, Patterson's, Dogtooth, Serendipity, Lineham and Highwood. Looking over Dogtooth towards a smokey Mount McPhail. 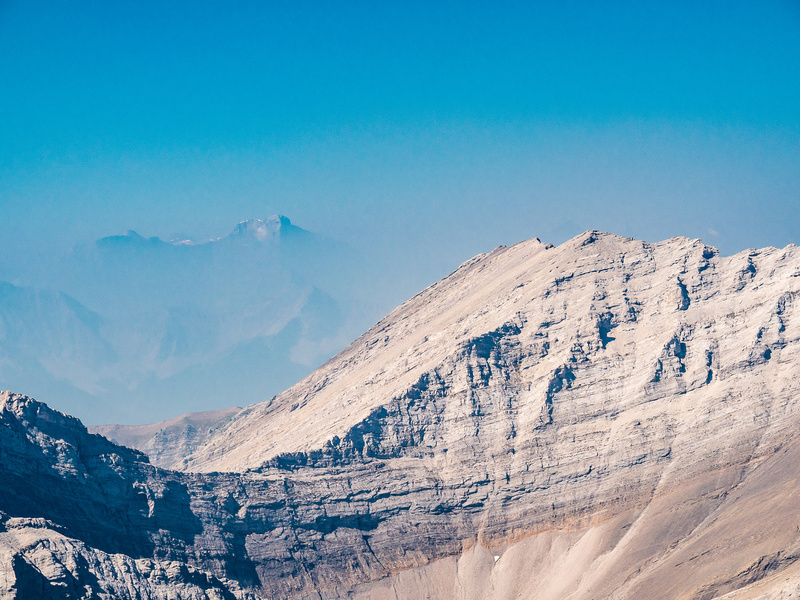 Looking north along the ~3km ridge towards Junction Mountain as Wietse approaches the summit of Pyriform Mountain. Leaving the summit and starting down the ridge to Junction Mountain.